Malrotation refers to abnormal intestinal rotation. Intestinal rotation is a complex embryologic process which is difficult to understand, even for most physicians. The intestines are outside the abdomen during early fetal development, and re-enter the abdomen in a complicated, predetermined sequence. Malrotation occurs when there is an error in one of these stages. The highly variable nature of malrotation is due to multiple different errors occurring at various stages of rotation. The autopsy prevalence is as high as 0.5 to 1%, but clinically malrotation only presents in 1 per 4000 live births. Males and females are affected equally. Babies are at highest risk of problems, with 50% to 75% of those who become symptomatic doing so in the first month of life and 90% during the first year of life. In nonrotation, the cecum is in the left lower quadrant and the base of the small bowel mesentery is broad and not predisposed to volvulus. These children can be safely observed. While volvulus can occur, surgery does not decrease risk. Diagnosis is with upper GI series which will show an abnormal position of ligament of Treitz or perhaps duodenal obstruction. 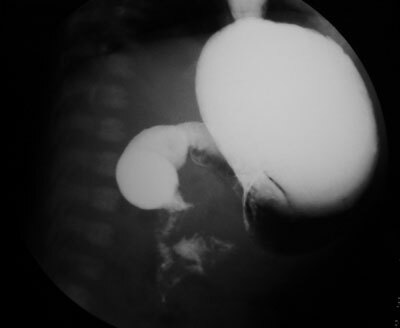 Barium enema may show an abnormally placed cecum, but normal placement does not Rule out malrotation. 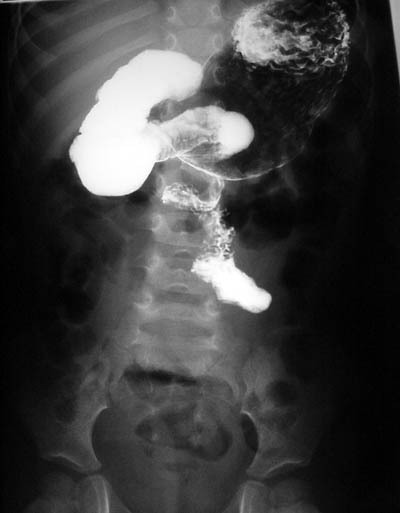 Transverse colon may occasionally show obstruction if volvulus is present. 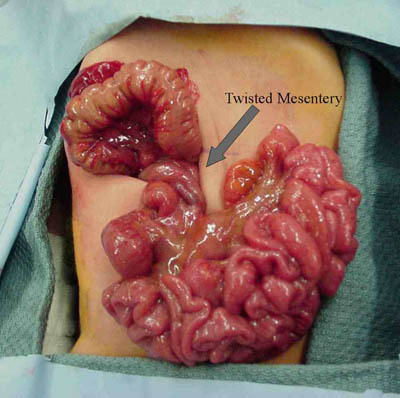 Volvulus: twisting of the bowel mesentery. This may lead to loss of blood to the intestine, dead intestine, and ultimately death if untreated. Approximately 60% to 80% of neonates with malrotation develop volvulus. Treatment for malrotation is a Ladd’s procedure. The bands obstructing the duodenum are divided if present, and the bowel is placed in position of nonrotation (small intestine on right, large bowel on the left, cecum in the left hypochondrium). Appendectomy (not described by Ladd) is often done at the same operation. No fixation of the bowel is done. Unfortunately, fixation of the intestine only leads to a higher risk of twisting around the fixated points.